"Loring Hospital is committed to providing exceptional healthcare in an environment of trust and compassion." Loring Hospital is a 25-bed, full-service primary care critical access hospital providing service to the communities in Sac County and beyond - Sac City, Lake View, Wall Lake, Odebolt, Lytton, Early, Schaller and Fonda. Loring is a non-profit company. The Hospitals' medical staff consists of over 30 family and specialty clinic physicians, along with a staff of 110 caring and professional individuals. From 24/7 emergency services to physical therapy; an independent living facility to minor and major surgeries, Loring Hospital is dedicated to providing top-notch service in a newly remodeled and renovated facility. Please see a full list of services on our services page. 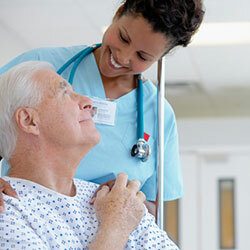 Patient care has and always will be our top priority. Loring Hospital's Mission Statement - "Loring Hospital is committed to providing exceptional healthcare in an environment of trust and compassion."